WANTED! ALL LIVE FIRING ANTI-TANK RIFLES AND ACCESSORIES. BETTER PRICES OFFERED THAN YOUR LOCAL DEALER! This site is dedicated to collectors of historical Anti Tank rifles in the UK, and the poor souls who had to lug these things about whilst being shot at! Anti Tank rifles were the first attempt at stopping a tank with a portable weapon, quick to reload and "easily" carried by one man. After moderate success by the German army with the first large calibre anti tank rifle in 1918 it wasn't until 1935 that the secret race begun to produce another more effective rifle, each of the main European armies had their own rifle, most went through a development process and as a result several prototype rifles were manufactured. As WW2 continued various improvements or even radical changes were introduced in an attempt to have an effect on the larger tanks that were already on the scene in 1940. You could argue that the rifles were out classed by tank armour as soon as they left the production line but they still had other uses against lightly armored vehicles or bunkers. It wasn't long before 20mm rifles were in use, however they were much heavier and not quite as portable. This website focuses primarily on these portable rifles below 20mm however I will mention two other interesting developments, the French 25mm Hotchkiss and the German PzB41 28/20mm taper bore gun, although these are verging on small artillery pieces that were usually towed or trailered into position. They were intended to be crew served as they were far too heavy for one man to carry. Technical/historical information on rifles of a similar or larger calibre can also be found here although certain details such as reloading data for Historical Anti-Tank rifles is virtually non existent and reloading should only be attempted by experienced shooters who fully understand the complex science of reloading for such large calibres. Bear in the mind the age of these rifles and potential risk of injury to shooter and spectator, section 1 rifles should bear proof marks - proving that the rifle is safe to use. The biggest risk is from flying debris raised by the expanding gasses that are vented back towards the spectators from the muzzle break. Swiss shooters have recently been having fun reloading for the PTRS with good results, they claim that the recoil "isn't too bad at all.....", and over in Australia Peter Meyer at Somatech has been reloading .55 brass with solid copper projectiles, machined to a match the original wartime projectile profile (should have some pictures of this ammunition soon). 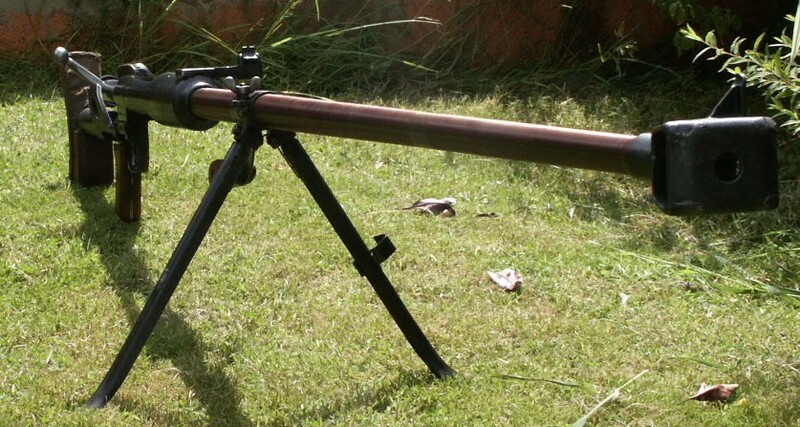 In the UK most anti-tank rifles are held as collectors items and are seldom shot, however with Police approval some people do perform accuracy testing and performance reviews to assist with historical research. The majority of UK ranges are not suitable for this purpose. Click here for a list of ranges that can be attended either as a member of a Home office approved club or as a guest of the club where firing 'may' be permitted, remember that the range needs to be cleared for your particular calibre, or have adequate insurance. Check out the latest AT rifle and range pictures, some very old, some new, feel free to send us your pictures for addition.